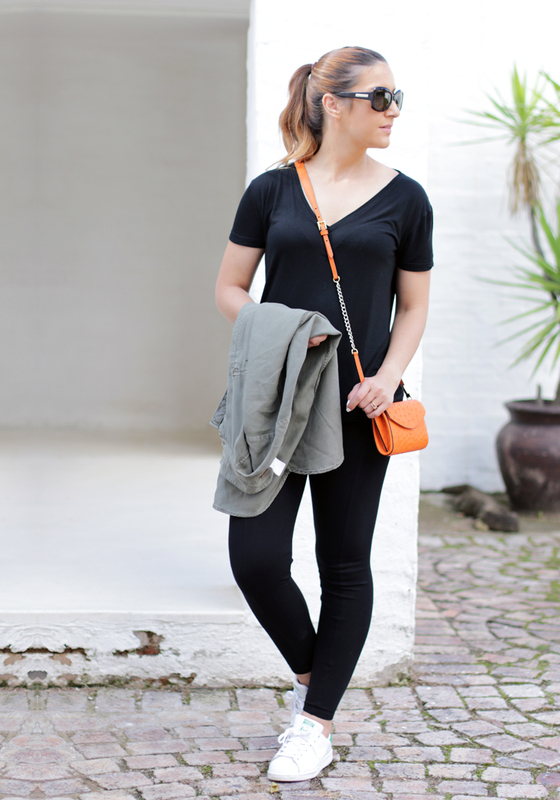 Hey handbag lovers listen up! If you’re looking for a luxury handbag to invest in, forget the over hyped brands you see flooding your Instagram feed, and look no further than your own back yard! LuxuryHandbag Heaven exists – right here in the heart of South Africa, and it’s called Via La Moda. I recently visited the Via La Moda showroom in Randburg, where I was given a sneak peek at where the magic happens… in the workshop, one storey down. It was like stepping into a story book; where proud and talented craftsmen and women, lead by the Master Leather Craftsmen, Hanspeter Winklmayr, worked meticulously on each piece to create a handbag worthy of praise. Hanspeter took me around each station, explained each process and every detail that goes into crafting a beautiful handbag. The way Hanspeter talks about each piece and the process, is as if each handbag were his very own child – I guess in way, they are. It’s no wonder his handbags are so coveted (and trust me, I am lusting), because you can literally feel the passion he has put into each piece just by listening to him speak. 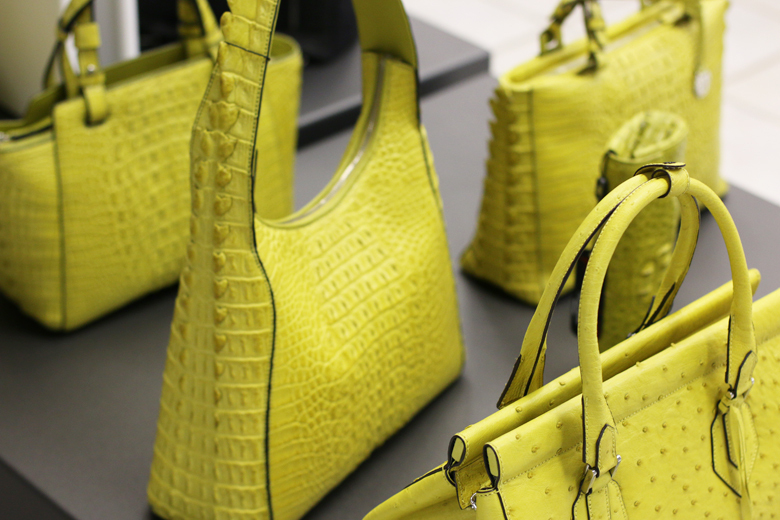 And then touching the bag allows your senses to fully appreciate the leathers, workmanship and attention to detail. 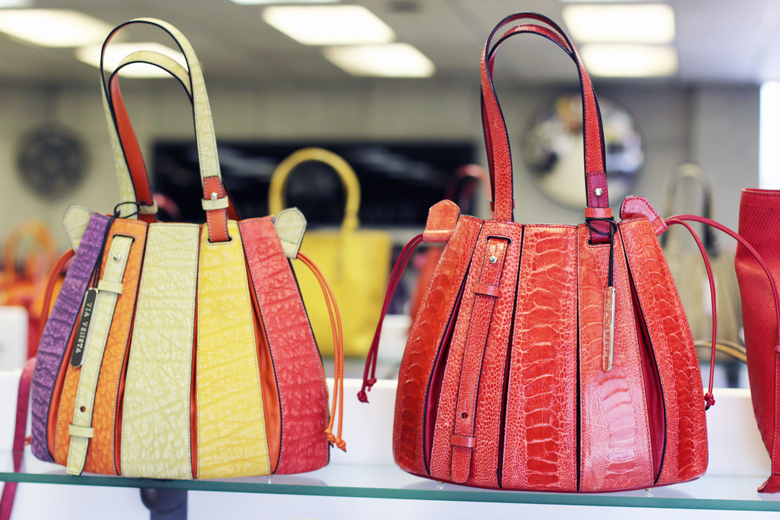 Via La Moda handbags have a strong heritage in leather craftsmanship that can be traced right back 1691. Hanspeter Winklmayr developed his skill in the fine art of leather crafting through his grandfather, which later lead him to open his very own brand in 1989 together with Walter Hauser. Via La Moda! Made proudly and 100% in South Africa. It’s a niche brand that speaks to the soul of a woman (or man for that matter), because as you already know, a great handbag is food for the soul. A handbag made with meticulous detail, the finest leathers and hardware to be loved and adored from the moment its design has been outlined on paper, to the moment it finds new love in your arms. While the Via La Moda collection is strongly based on exotic leathers (crocodile, ostrich, python and buffalo), they do also offer a range of buttery soft cow hide leathers as well, which is great if exotic skins are not your thing. Either way, it’s good to know that all leathers used in the creation of a Via La Moda piece have been ethically sourced and the brand complies with CITES, to ensure that each piece of raw skin has been correctly obtained. When you see the bags in detail, you’ll understand why a Via La Moda handbag is THE handbag to have and to hold! 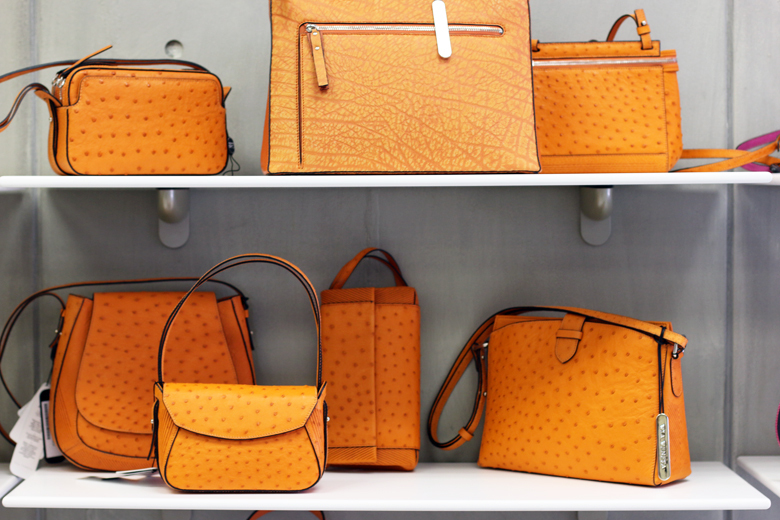 There were more than a few handbags that stole my heart, and while I got to play dress up with a few of them to show you just how gorgeous they are, sadly these beauts are not mine. That doesn’t mean, I’m not saving up for one! But the problem I’m faced with is which one? This tangerine Via La Moda Candy purse (R9 504) has my name written all over it! It’s made from 100% ostrich skin and has the most beautiful gold hardware. Tell me it doesn’t suit me to a tee?! Although it would look great with a little black dress for an evening affair, the size and strap of this bag make it the ideal size handbag for when you just need to pop out to the shops. 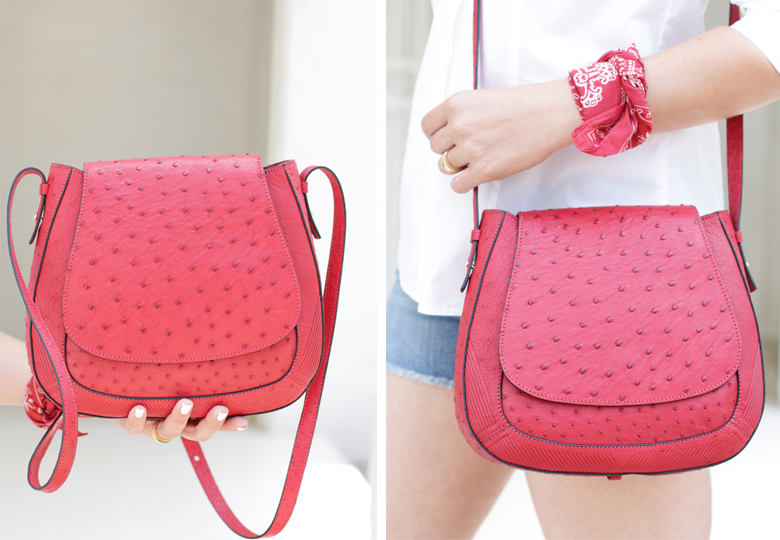 This red hot piece is the Via Veneta Provoque Kirsty bag (R13 608) a gorgeous festival ready saddle bag. Made from luxurious ostrich skin, the thing I absolutely adore, is that the strap is long enough to wear as a crossbody and features a wrap around option to make the strap shoulder ready. It shortens by looping through the bottom attachment, which totally conceals that it has a long strap. GENIUS! This is the Via Venetta Gabriella Hobo (R4 837) and it’s one of the brand’s non-exotic leather pieces. 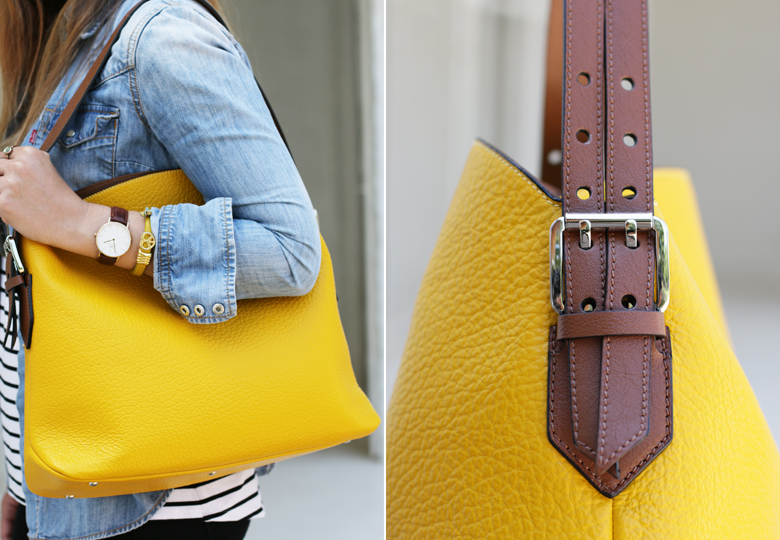 Buttery soft in a gorgeous pebbled leather, this bag is such a fun everyday handbag that is so different, yet so perfect! It’s one of those bags that would make a great everyday piece. It can be toted around with very little contents and still look great, or if you’re carrying the kitchen sink, it can easily adapt to allow space for everything you need. A Via La Moda handbag is a timeless, special handbag that is luxurious in every way. It’s one of those bags that you will always get giddy with excitement for and a handbag that you can pass onto the next generation. Check out more beautiful handbags on Via La Moda’s website, or if you’re in Jozi make a trip to their showroom (it’s well worth the visit) where you can feast your eyes and pick out the handbag/s that speaks to your soul. Previous Post -eneded-Win A LOVE hamper with Cadbury P.S.